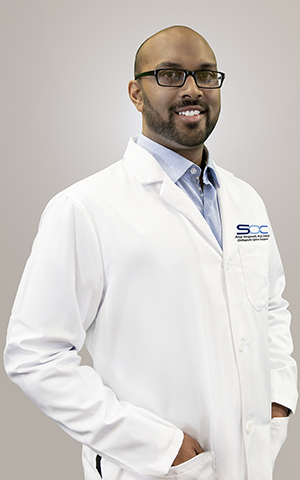 Dr. Anup Gangavalli is an orthopedic surgeon specializing in minimally invasive and reconstructive spine surgery practicing in our offices in Boca Raton, Coral Springs, Deerfield Beach and Plantation. Dr. Gangavalli began his medical path in Stony Brook University in New York where he obtained a BS in Neuroscience with Dual Honors in Research and a Minor in Chemistry. He went on to complete his Medical Degree at the Stony Brook University School of Medicine. He attended the Orthopedic Surgery Residency program at St. Luke’s University Hospital & Health Network in Bethlehem, PA and was selected PGY-5 Chief Resident. Then, he completed his fellowship training in Spine Surgery at the Cleveland Clinic Health System in Cleveland, OH. This prestigious orthopedic/neurosurgery fellowship program is comprised only of top candidates. Only three fellowship-trained orthopaedic surgeons and two neurosurgeons are recruited. Dr. Gangavalli has gained ample exposure to a wide range of spinal pathologies and an extensive training in the diagnosis and management of adult spinal disorders including degenerative cervical, thoracic and lumbar disease, spinal deformity, intradural and extradural spinal tumors, spinal trauma, spinal infections, congenital spinal abnormalities, and complex reconstruction/revision cervical and lumbar pathology. To schedule an appointment with Dr. Gangavalli, call us at 888-409-8006. Gangavalli AK, Malige A, Nwachuku CO. Patient Comprehension and Compliance to Post-Operative Pain Regimens in Orthopaedic Trauma. Pennsylvania Orthopaedic Society Podium Presentation, Erie PA. May 2017. Gangavalli AK, Malige A, Haydel C, Nwachuku CO. DVT and PE in Tibia & Fibula Fractures: A Retrospective Profile of Thrombi as Detected by Duplex Ultrasound. AAOS Podium, San Diego 2017, March. Gangavalli AK, Davidson, Iyooh, Malige A, Savage J, Benzel, E Mroz TE. Opioid Abuse in Surgical Spine Post-Operative Patients. Gangavalli AK, Malige A, Matullo KM, Nwachuku CO. Role of Traction in the Spine and Upper Extremities. Gangavalli AK, Nwachuku CO. Management of Distral Femur Fractures in Adults; An Overview of Options. Orthop Clin North Am. 2016 Jan; 47(1):85-96. Matullo KM, Gangavalli AK, Nwachuku CO. A Review of Lower Extremity Traction in Current Orthopaedic Trauma. J Am Acad Orthop Surg. 2016 Sep; 24(9):600-6. Gangavalli AK, Malige A, Terres, George, Nwachuku CO, Rehman S. Opioid Abuse in Orthopaedic Trauma Post-Operative Patients. Journal of Orthopaedic Trauma, 2016, Oct 26. Michael A. Bell, Anup K. Gangavalli, Adam Bewick, Windsor E. Aguirre. Frequency of Ectodysplasin alleles and limited introgression between sympatric Threespine stickeback populations. Environmental Biology of Fishes. 2010, 89(2):189-198.